Emergency care available. We can help you today! No health insurance is needed. No out-of-pocket expense in most cases. You do not need to see an attorney first. Our doctors have over 50 years of combined experience treating auto accident injuries, having helped thousands of people get back to a pain free, health life. You will experience fast relief of pain due to injuries. It is a natural solution to back pain, neck pain, headaches, and other joint injuries. It is a non-invasive treatment. Chiropractic adjustments feel great! Most cases can be accepted with no out-of-pocket expense. We recommend you visit us as soon as possible after experiencing an auto accident. We’ll have you complete some paperwork to get specific information about your injury. Our front desk will get your insurance information sorted out and checked for you. Then you’ll get a thorough evaluation. Often, we need to take X-rays to make sure there are no underlying serious injuries such as ligament instability, whiplash, or minor fractures. If we feel we can help you, we’ll make a recommendation of care to help you feel better FAST and get your condition to a fixed and stabilized so it won’t return and cause long-term issues. We’ll get to work on checking all of your insurance coverage on the first visit. 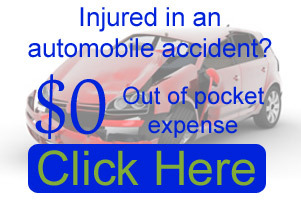 Most auto injury cases are handled with NO out of pocket expense to you and we’ll take care of all the billing. If it becomes necessary we can provide you with attorney referrals to make sure you get the care you need. Those suffering auto accident injuries will find the pain relief and healing needed with us.